This wasn’t my first time seeing this production as I saw it four years ago so when I went to see it this time I didn’t want my overall thoughts be shifted by nostalgia. I can say with certainty that the show gripped me within seconds. On the 1st of November I was given the privilege to see ‘Wicked’ at the Wales Millennium Centre. I went to see the performance with another member of WICID and as soon as we entered the building we knew we were in for a treat. Everything, including the sign on the outside, was illuminated in a fluorescent green. We were even allowed to take pictures with part of the ensemble cast. After waiting with other members of press we took our seats and the lights went down, the curtain went up and the cast made their way on stage. As soon as the opening number began we were glued to our seats and after that we were entranced in a land full of Witches, Wizards and monkeys. 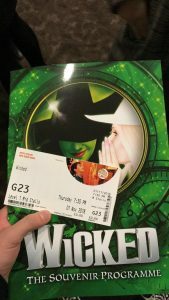 I believe the absolute highlight of the show were the two leads, Elphaba (the wicked witch of the West) and Glinda (the good witch) who were both played by Amy Ross and Helen Woolf. The on stage chemistry these two had really made you believe their friendship and the sacrifices they had to make for one another. Their vocals were also a highlight and how their different ranges demonstrated the conflicting personalitys; Elphaba having a low and more demanding voice while Glinda had a higher operatic voice. Another highlight of the show was the props and set used to bring the audience into the land of Oz. Every scene hada different colour palette which helped present the mood and atmosphere of the location. For example, when we are shown the dorm room at Shiz for Glinda and Elphaba there is a distinct difference with one side being gloomy and more shadowed whilst the over is over saturated in pink and more flamboyant colours. 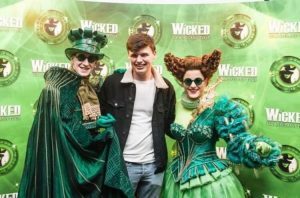 But the stand out moment of this was when we first entered the Emerald City where the audience was presented with fluorescent green suits and dresses, the azure blue backgrounds and a rather familiar yellow brick road. Finally, it would be wrong of me to not mention the music and singing produced by the ensemble and the live orchestra conducted by Dave Ross. 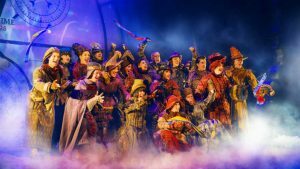 When the songs ‘March Of The Witch Hunters’ and ‘No One Mourns The Wicked’ began the harmonies were at its peak and an audience member could clearly see the hostility of the ensemble being conveyed. Also, the use of themes stitched through the music was impeccable. For example, the familiar riff from ‘Somewhere Over The Rainbow’ was used throughout numbers but changed ever so slightly by going an octave higher than lower. Each individual character had a distinct motif that represented their characters personality with Glinda having a more bubbly and lively theme and Elphaba having a more sinister and commanding theme. However, as said I didn’t want to be blinded by nostalgia and did find a few little problems throughout theperformance that could do with a bit of improvement. The main one I had was that because our two female leads had such powerful and strong vocals, the other characters seemed weaker, in particular the character of Fiyero. While Aaron Sidwell did a tremendous job as the arrogant prince turned fierce general, his vocals seemed to get progressively weaker. The character did have a strong opening with the fast-paced ‘Dancing Through Life’ however, particularly in the second act song ‘As Long As Your Mine’, Sidwell had gotten much weaker. At some points he was given high notes that were just too challenging for him. The same could be said for Steven Pinder’s Oz however his songs had so much charisma and charm that you were entertained by him during songs like ‘Wonderful’. Another flaw within the performance, this can’t really be blamed on Stephen Schwartz and Winnie Holzman as the play is based on Gregory Maguire’s novel, and that’s the underdeveloped characters. This doesn’t mean lack of on stage presence as we learn about characters like Nessarose and the king through characters interacting and dialogue but a character like Madame Morrible is given little to no motivation. If we are not given any development for this character then why should an audience member care when she partakes in any scene. Especially at some points in the show her acts affect our protagonists, there are moments when her deeds is only for personal achievement; as we don’t know much about her backstory or why she does what she does there is no care in what’s going to happen to her. One character who I also hope will get more expansion in the future is Doctor Dillamond. This is a character who faces discrimination and racism (at least for a goat man) who also is one of the few who is consistently kind to Elphaba but as he suddenly disappears from the story there is no resolution to his character and no structure or story for him other than being a plot device for Elphaba. Despite these minor flaws, ‘Wicked’ was a spectacular show that was both whimsical and intense. Everything from the impressive props and costumes to the catchy toe-tapping songs were memorable and will stay in the mind of a viewer for years to come. Thank you to the Wales Millennium Centre and WICID for making this a night to remember. Please click the link below to find out what else is going on at the WMC!